Burt West was the young ward of the hero known as Super-Tough and was trained at a young age to also fight crime. At the age of 14, the government took notice of the teenaged Young-Tough and were considering him for membership of Youngblood. He was reluctant to leave his partner but the opportunity was too great to pass up. On their final mission together, Super-Tough and Young-Tough oversaw the transport of the original Nega-Bomb to a military base. The weapon was claimed by their arch-enemy Damien DarkLord but the duo managed to fend him off. The villain’s future incarnation of DarkLord then emerged and detonated the device. Super-Tough and DarkLord vanished in the blast while Young-Tough was left horrifically scarred on his face. This meant that Youngblood would reject their potential member, leaving the young man feeling both alone and rejected. 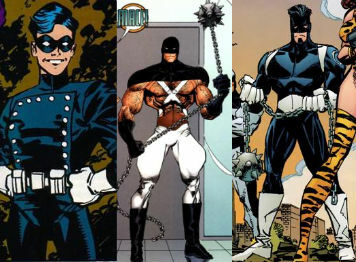 Over the years, Young-Tough became more and more aggressive and ultimately took on the vigilante guise of Mace. He took to the streets of Chicago and waged war upon the super-freaks that would prey upon innocent humans. When Dragon was possessed by Horde, Mace was the person who destroyed the leech responsible. He would continue his assault upon Dragon which resulted in him getting arrested. Mace found himself incarcerated in Stronghold Penitentiary, locked up with the very people that he detested. When CyberFace attempted to seize control of the Vicious Circle during the Gang War, he engineered a breakout at the prison. He manipulated events so that Mace would encounter the OverLord armour, knowing that when the vigilante used the suit that its defences would fry his brain. A now hospitalised Mace remained in a secure medical facility for years in a brain-dead state until one of the Wicked Worms was sent to possess him. Mace’s brain was jumpstarted and he became a pawn of Horde, getting sent along with She-Dragon to take down CyberFace’s rebel faction of the Vicious Circle. When the heroes were liberated by Dragon from the leeches, She-Dragon apprehended Mace. Super-Tough had since been discovered to have survived the Nega-Bomb detonation and had been living on the duplicate Earth known as Darkworld. He was reunited with the incarcerated Mace, revealing that the pair of them used to be lovers. Mace remained locked up until Stephenson decided to cut him a break and recruited him for membership within the Special Operations Strikeforce. Mace’s inclusion into the team was a controversial one, not least because one of his new teammates was the Shrew, one of the freaks that he had assaulted during his time as a vigilante in Chicago. He ultimately proved Stephenson’s faith in him to be misplaced when he went rogue, killing a homophobic author whom he had been assigned to protect, sending Mace on the run from the law. It was then that OverLord II lied to Mace, claiming that Dragon had killed Super-Tough so that Mace would vow revenge. Super-Tough had actually been abducted by the villain and locked away in a hidden dungeon. Mace took part in an execution attempt on Dragon but was ultimately defeated and locked away, leaving a liberated Super-Tough disappointed in the actions of his old friend. In the reality that Dragon arrived on following his encounter with Damien DarkLord, Mace was one of those people affected the most by the lack of DarkLords presence. The original Nega-Bomb never detonated and Mace did indeed join Youngblood after his tenure fighting alongside Super-Tough. His partner retired from action and Young-Tough took on the codename of his mentor. The new Super-Tough remained in the government’s good graces over the years and following CyberFace’s removal from power, a new Special Operations Strikeforce was assembled and Super-Tough joined the team. He served with the group on numerous missions against the likes of the Vicious Circle, the Nuclear Man and the Forever Serpent. When the S.O.S. attempted to abduct Emperor Kurr and restore him to his Dragon persona, the entire team was massacred by the villain. Super-Tough survived the initial onslaught but was soon picked off by the merciless Kurr.